What my port­folio con­tains today? 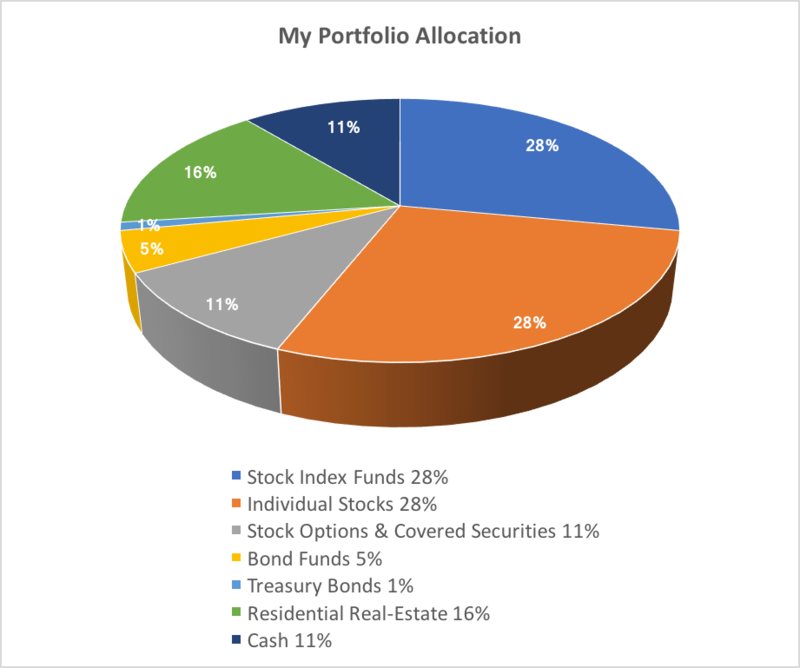 As you can see from the pie chart, about two-third of my portfolio is invested in stocks. Mostly in either individual stocks or stock index funds. I have some real-estate investments but they are about one-sixth of the portfolio. I keep some cash for my near-term needs and the rest in bonds. I started building out my investments in mid-90s so I have some long-dated tax-deferred accounts like my first employer’s 401(K). About half of my stock assets are in tax-deferred accounts (401Ks, IRA, Roth IRA) and the rest in taxable brokerage accounts. When I began saving, I was initially invested entirely in stock index funds. 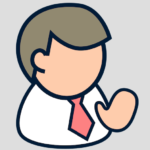 Over time, I developed interest in understanding individual businesses and started dabbling in occasional company stock. But it wasn’t until 2006 that I started pulling money out of index funds and buying individual stocks on a regular basis. I do it gradually as I identify good businesses to invest in. I also have a portion of my portfolio allocated to Stock Options & Covered Securities. My goal with this money is income generation – albeit at the expense of capital appreciation. My target is 10 to 12% annual income. This is mainly an option writing strategy that is based on the same individual securities that I have previously researched and invested in. I will cover the details in a future post. I also keep some cash. Two reasons for holding cash: (1) a rainy-day fund and (2) dry powder. I keep two years’ worth of my family’s living expenses in rainy-day funds. When stocks go into a downturn, I wouldn’t want to sell a lot of them. I could then use my rainy-day cash while waiting for market to recover. One thing I struggle with is the size of the fund – is two years enough? Or should I increase to 3 years? Market downturns usually last less than two years but it takes longer for the market to recover to its prior peak. Dry-powder fund is meant for opportunistic buying whenever market panics and sells stocks too cheap. It does not happen very often but when it does, there are bargains aplenty. Keeping spare cash for those times is a great long-term strategy. More on my dry-powder strategy in this post: I use cash as dry powder. (1) My portfolio is in growth mode. I could switch to safer, less volatile assets like government bonds and money market funds. But then I won’t get much growth out of it. I need my investments to grow. For that, I need to take measured risk. I want my investments to grow beyond just beating inflation. I am in early 50s. Average life expectancy for a U.S. male is 78 years. My wife is 7 years younger. We have kids in high school. Besides, we don’t want to die broke. We want to leave some financial legacy for our kids. With all this in mind, I needed a portfolio that not just beat inflation and support our lifestyle but also take care of future family needs. In other words, a portfolio that grows. (2) Stocks are best candidates for growth. From within my accessible asset classes, common stocks are best suited for growth. Real-estate and bonds don’t grow as much. Commodities won’t cut it either – besides I don’t know enough about them. Cash-like assets (money market, CDs) won’t help. What else is out there? I would have loved to invest in Venture Capital with Marc Andreesen or Private Equity with Steve Schwartzman but they are way out of my league. These alternate assets have done well for patient investors but small individual investors like me have no access to them. (3) Stocks are in my circle of competence. Unlike other types of assets, I understand stocks really well. I have been involved in stock investing for last 20+ years. Even though stocks tend to be more volatile than other assets, I am very comfortable with their roller-coaster rides. I have lived through two major market crashes over my investing lifetime. I believe I know enough to take prudent risk with stocks in my portfolio. Besides, I keep some cash as dry powder as I explained earlier in the post. As Howard Marks puts it in his book: “[two] main risks in investing .. the risk of losing money and the risk of missing opportunity. It’s possible to largely eliminate either one, but not both.” I try to take calculated measured risks in my portfolio so that I don’t lose out on growth. It follows that my portfolio will lose money on occasions but I am not concerned about short-term money loss so long as I can avoid permanent losses. What do you all think? Am I being imprudent with my portfolio allocations? Taking on too much risk? How does your portfolio look like?